Conveniently located at the intersection of Phillips Highway and Old St. Augustine Road, we can’t wait to welcome you to our newest location. Our goal at each of our Yoga Den studios in Jacksonville is to create a safe space for you to experience the positive life changes that happen because of yoga. Whether you are an experienced yoga master or this will be your very first class, we are happy to provide a judgement-free environment where you can hone your skills. Our ultimate desire is for you to begin or maintain a regular routine of yoga so you can reap the mental and physical benefits of your effort. Welcome To Yoga Den Bayard! This is our most recent addition to the Yoga Den family! Conveniently located at the intersection of Philips Highway and Old St. Augustine road, this Bayard yoga studio is just off the I-95 exit by Baptist South Hospital, and easy to reach from Racetrack road, Nocatee and Beach Walk. In short, we picked this location to make your life easier, because getting to your yoga classes should never be a hassle! Try Our Jacksonville Yoga Classes In Bayard! We offer amazing yoga classes seven days a week for all fitness levels, and our teachers are all trained with the Yoga Den Philosophy: No judgment, listen to your body, and find what feels best for you. Our goal is to foster an environment where you can come as you are and enjoy the amazing benefits that practicing yoga can offer. While this location is our newest, the yoga studio in Bayard does an excellent job of creating a welcoming environment for every single person who takes our yoga classes from beginners to experts. Need to borrow a mat? No problem, we have a wide variety of props — mats, blocks, bolsters, straps, and blankets — all available for use with no rental charges associated. 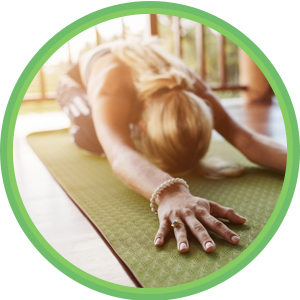 At Yoga Den, we are committed to helping you begin or maintain a regular yoga practice and want to make it as easy as possible for you to do so. We know how yoga can and will change your life in many positive ways and want to provide that experience to as many people as possible. Feel free to download our free app to have the schedule handy, and even sign up for classes and yoga workshops from your phone. We look forward to seeing you on the mat; the first class is always free so you can see if yoga is something you want to commit to! For the latest information on our yoga studios in Jacksonville, including the Bayard Yoga Den, make sure to follow us on Facebook and Instagram!